The State Bond Commission approved financing Friday for a wide array of economic development initiatives and the first wave of relief for homeowners struggling with crumbling foundations. The panel allocated bonding for: soccer stadium renovations and other projects in downtown Hartford; grants to several expanding private companies; and for a project to remove docks and mooring blocks encroaching on the U.S. Naval Submarine Base in Groton. “This is a significant win for Connecticut’s economy,” Gov. Dannel P. Malloy, who chairs the bond commission, said after Friday’s meeting. The commission approved $17.9 million for several projects overseen by the Capital Region Development Authority. The largest of those involves $10 million in planned renovations to Dillon Stadium in Hartford. A group headed by Woodbridge businessman Bruce Mandell is hoping to bring an expansion team from the United Soccer League to the stadium, located in Colt Park, in 2019. Another $5 million earmarked for the authority would be used for renovations to the Church Street parking garage in downtown Hartford. The bond commission approved $35.5 million in financing to provide a second, forgivable loan to one of the world’s largest hedge fund managers, AQR Capital Management, to assist in its expansion. The firm, which already has added 797 jobs with state assistance, must retain all of those and create another 189 within the next five years to receive loan forgiveness. $14 million for ASML US in Wilton, which manufactures optical lithography machines — part of a process used to make computer chips. The grant will help the the company expand and add at least 524 new jobs in the next seven years. $4 million to Morgan Truck Body to establish a new manufacturing facility in Plainfield and create 120 new jobs. $2.5 million for Okay Industries Inc. to expand manufacturing facilities in Berlin and New Britain and create 62 new jobs. $2 million to Polamer Precision Inc. to expand its New Britain manufacturing facility, which is expected to create 200 new jobs within the next three years. $1 million to help Viiv Healthcare Company relocate from Wallingford to Branford and add 20 jobs within the next five years. $1 million for Global Atlantic Financial Company to support its relocation from Simsbury to Hartford and to create at least 59 new jobs in the next seven years. The commission also approved $525,000 for the town of Waterford to demolish derelict docks and mooring blocks across the Thames River from the naval base in Groton to enhance submarine operations. 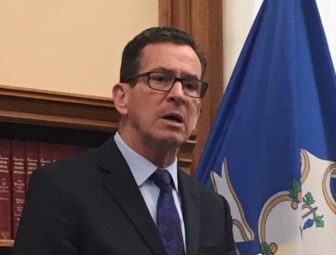 The commission also approved $350,000 in start-up funding for the Connecticut Foundations Solutions Indemnity Company, which will administer the state’s relief program for homeowners struggling with crumbling foundations. More than 34,000 homes, primarily in eastern Connecticut, have foundations that are crumbling — at least in part — because of quantities of the mineral pyrrhotite present in the concrete aggregate, according to a January 2017 report from the Department of Consumer Protection. The new state budget enacted last October created a quasi-public, not-for-profit insurance company charged with helping homeowners repair or replace crumbling foundations with the least possible borrowing. The company also can help homeowners pay for testing of their foundations. Lawmakers authorized $20 million in bonding this fiscal year and in each of the following three to support the Crumbling Foundations Assistance Fund.